The new CD series »Musikerbe Thüringen« (Thuringian Musical Heritage) funded by the Free State of Thuringia and produced by cpo depicts a historical musical landscape that is unique in it kind and of international significance. 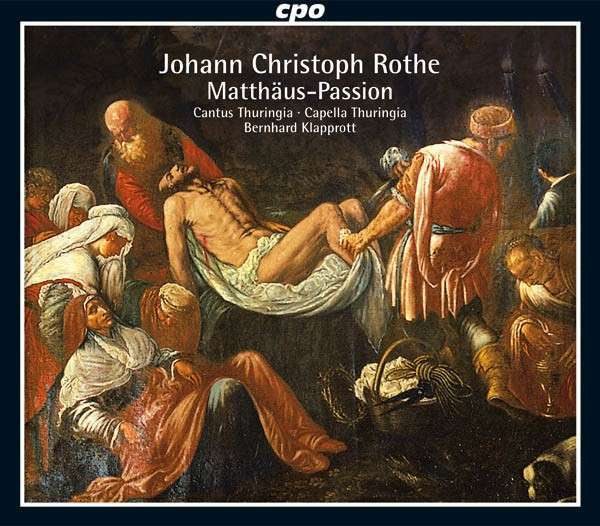 The first release in this edition dedicated to the discovery, publication, and dissemination of important Thuringian musical monuments features the oldest extant oratorio passion from Central Germany: Johann Christoph Rothe’s St. Matthew Passion. Biographical information about Rothe is scant, and it remains unclear whether he was familiar with the figural passions composed during prior decades. In any case, his passion composed in Sondershausen in 1697 offers eloquent testimony to the genre history of this musical form. The stylistic features of Rothe’s passion were probably typical of the passions performed in Thuringia during Johann Sebastian Bach’s youth. The formal spectrum represented in Rothe’s settings ranges from the simple strophic aria to highly expressive solo songs in the style of the contemporary opera framed by ritornellos of the two violins or of the four-part gamba consort.